All right already! I hear you! The city was really weird! From what she’d seen elsewhere on the continent the place should be teeming with street kids, littered with junk, and subdivided into competing territories. Sure, there was some of that – but it looked like some sort of massive clean-it-up push was underway. Wait a moment… Some hurried searches – at least seen through the eyes of a Solar Detective – looked AWFULLY odd. It was just… accepted… by most of the mortal groups that paid any attention at all that tremendous numbers of street kids had to be finding homes or something just as they had been for decades – or centuries! – because they obviously couldn’t just VANISH. But seen through HER eyes… It was obvious enough to HER that at least a million a year did indeed just vanish, never to be seen again on Earth. Offworld Raksha perhaps? After all, planets with sizable populations were fairly rare, while small outposts of Raksha were widely scattered. Where else would they get their livestock/pets/servants? And the mortals… mostly didn’t bother looking. Who’d miss them when they were gone? Street kid disappearances were absolutely normal, and had been for as long as anyone could remember. Sure, the Cops didn’t want a pile of small bodies full of bullet holes to turn up – but as long as one DIDN’T they were happy. Huh. Nobody more prominent was disappearing – and even adjusting for missing street kids, crime was down a LOT too. That was really weird, especially considering the local economic disparities! Looking at the local news… Corruption was down, efficiency was up, there was more acceptance of necessary-but-annoying measures, and there’d been no rioting for weeks now. What was going on? If it wasn’t a Guardian, it was some other Exalt fixing things for their own reasons. She went hunting for signs of overt supernatural activity. After all… she might well have some competition! That was easy. A quick look in the archives showed that the local papers had been full of reports of “god talking to me”, “voices of conscience”, and similar. The churches were freaking out a bit over that – it was Catholic territory – but quite a few clergymen had heard it too, mostly telling them about the benefits of various social programs, and why they should promote them. Cops had mostly heard why corruption would get them into trouble, what areas they should focus on, where evidence could be found, and so on. Most of the politicians weren’t talking, although a few had reversed positions based on “listening to their consciences”. The most recent reported cases looked like… about two days ago, but anything much more recent than that would hardly have made it into the news yet. It was reasonably likely to have been within the last day. Cost —, Mins: Linguistics 4, Essence 3, Type: Permanent. Prerequisite Charms: Any Linguistics Excellency. “children”, “criminals”, “humans”, “dragon kings”, and many more). dice-boosting effects, but no other charms, artifacts, or effects. Huh! That certainly sounded like a Guardian… She’d have to congratulate him on the good work! And time to get out the chewing gum again. It looked like… about eight miles down the coast – hardly any distance at all! – and about six hundred feet down. Some sort of park area? She headed that way – and found that the roads were currently blocked off by the Park Service, and there was a staff-type turning people away. Hm… rainforest jungle, with rough terrain underneath – lava flows with lots of old gas bubbles that could collapse when stepped on mixed with easily-eroded ash-filled spaces between them, It would doubtless be easy to get past the ranger, but even with her boosts fast ground travel was probably going to require sticking to the road. There were warning signs against leaving the roads and posted paths even by a few steps, since it was so easy to wind up trapped down a hole in that mess. A normal human trying to get through the area would probably wind up making about a mile a day – if they were lucky enough not to get killed or get lost. No wonder the area was a nature preserve; no one could possibly use it for anything else! Still… not much choice. At least a rain forest offered plenty of cover by the time you were ten feet off the road. She headed back towards town until – a hundred feet or so back – the curve of the road put her out of sight of the park ranger. Fortunately her stealth skills, parkour, and athletics charms were enough to get her safely past the roadblock and back on the road once she was sure that no one was monitoring her… Judging by the stunt with the avalanche, the youngster she was following was probably trying to stop the eruption. Huh. That terrain was ROUGH – but she didn’t want to drag some well-meaning human park employees into Exalted affairs – and they might have tried to follow her if she’d just brushed past them. The mountain was only a modest-sized volcano, but it was emitting some tell-tale sulfurous fumes. According to the link… the target was somewhere underground, beneath the volcano. Well, volcano gods often had sanctums below their calderas! Unfortunately, there were lots of lava-tubes, cracks, fumaroles, and other possible entrances – but it was VERY hard to tell how deep they went! It looked like… a middle-aged man with a beard, a T-shirt that said “Volcanologists do it with more heat”, a notepad, a few instruments, and a pocket computer. Hm… something occult about the man was making her eyes water a bit! 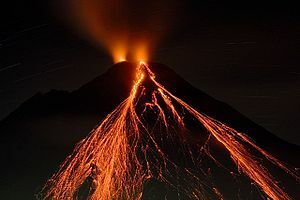 While vulcanologists really did hang around active volcanoes – being either very brave or reckless bastards! – but his presence at this PARTICULAR eruption DID suggest that he was more than a normal schlub. Hmm. So whoever this was had either arrived before this guy, or evaded him. If it was the latter, she was impressed! He caught her, after all – even if she had been surveying the mountain rather than hiding. Still… watering in the eyes, vulcanologist – she’d put money down that she was speaking with a Fire Aspect at the moment! She dropped her own cloaking; if worst came to worst, they’d have a footrace up the mountain. He too wavered a bit, and abruptly looked quite a lot more imposing, with a great big sword and some armor to go with the gear. The T-Shift had probably been an illusion. Well damn! It would depend a lot on just WHERE and HOW BIG – but an underwater eruption… most likely said “Tidal Wave”. It might threaten hundreds of miles of coastline! (Aikiko) “Huh! So you’re negotiating with the volcano god? How’d you find the kid? “Personal Debris”? Ah! The old “hair and fingernail clippings” routine. Well, that was easy enough if you could get a hold of that kind of thing. Even a lot of mortal thaumaturgists or “psychics” could handle that kind of link. Drat it! If only she’d brought the Behemoth Cloak along – but she’d been worried about Mechagodzilla using it to track her! Wait a moment… thanks to Charles she was in multiple places at once, and the effects of the Cloak were purely supernatural. Would it matter WHERE she wore it?… Huh! Evidently not! THAT was pretty convenient! Aikiko thought for a moment – but she couldn’t see why she’d be inclined to make it worse anyway! One short oath later, the man was telling her what he knew about the route down – but his information only went (quite literally) so far; if there were branchings and such beyond that… he hoped that she was good at tracking! Which did seem likely to him; otherwise she wouldn’t have gotten this far! With no need to hide, Lightning Speed it was! The tunnels down were mostly fissures and lava-tubes. Fortunately, the choking fumes and dreadful heat…. flowed over the Cloak and passed harmlessly. Unfortunately, the gum was no longer helpful! An indication of direction didn’t say which twisty tunnel or fissure to clamber through to ultimately wind up going that way! Hrm… what to use? It was so hot that any bits of hair or cloth would probably get burned up – and they would have the same problem anyway. Scent? The fumes would choke it out. Traces in the dust? The constant shaking was bringing down a steady rain of dust. Sure, she was an Exalt – but she wasn’t a tracking specialist! A bit of thaumaturgically-boosted prayer got a response quickly enough. A minor god, made of volcanic ash with great gaping holes in it, swirled into an (essence-cheap) image-only appearance. The voice was a rumble of shaking stone, and the mouth was a crack into a glowing throat of volcanic ash at a red heat. Neat! He provided directions through the twisting, superheated, maze – which brought her out on a ledge, with several chairs and tables shaped from obsidian and volcanic stone, above a massive pool of fuming magma. The red glow of the pool illuminated the chamber and the massive arch of the ceiling. Three Humans – two hanging back, and one at the edge of the ledge and talking – were speaking with a modest group of volcano, earth, and disaster gods. That seemed to be the substance of it anyway… the region had been largely peaceful (at least in his category) for more than a millennia, yet proper sacrifices had not been offered to him in centuries! He would tolerate it no longer! Those teeming, worthless, Mortals WOULD PAY – no matter who – or WHAT – it was who intervened on their behalf! The other gods were a lot less active about it – but they weren’t arguing either. They probably had the same issue; they just weren’t so empathetic about it. Actually, most of the others had both more to do and were less propriated to begin with; they weren’t going to argue with Rikandithu directly – he WAS the most powerfully destructive one amongst them of course – but they saw no reason why they couldn’t settle for a SMALL event to remind the humans to pay attention to volcanoes, rather than a massive release that would kill tens of millions of them. Looking at the human negotiating… it was a rather young boy, and he was indeed radiating air and wyld energies in what certainly looked like a manse-aura! Meanwhile, one of the two who were hanging back had noted her presence with some surprise. Meanwhile… Rikandithu’s intimidation didn’t seem to be very effective on the kid – but his rant was still going strong; it really looked like he was working himself up to something drastic!